I knew I needed to get this project done and posted before the 1st, and I guess I'm cutting it a little close. I changed this a little from my original idea because Hobby Lobby didn't have what I needed (did you know they order once for Christmas, and that's it...for all Christmas stuff!) (they're out of most of their Christmas stuff and it's not even December). I had wanted to use the plastic ornaments that separate in half and then have candy or a present in each one, but I think I might do that next year for B. Anyways, with that all out of the way, let's get started. First you will want to cover your surface with newspaper. 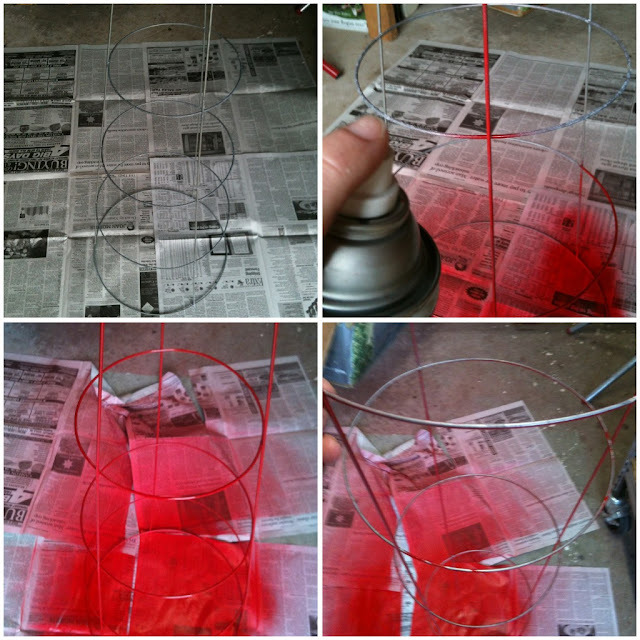 Stand up your tomato cage with the pokey legs up, take your spray paint and spray it well, allow to dry for 15 minutes. Turn upside down and spray the undersides of the cage, then stand it up again and let dry for at least 2 hours. 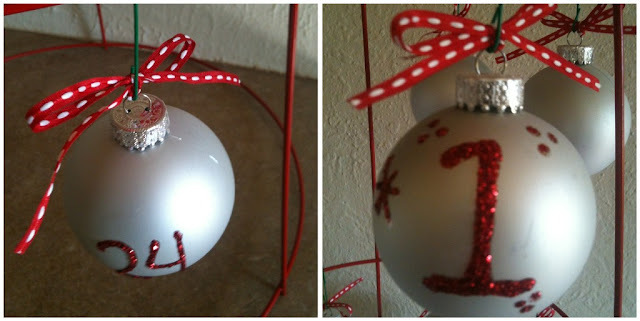 Number your ornaments using the glitter glue, or you could use acrylic or if you have a fancy cutter you could cut out vinyl. 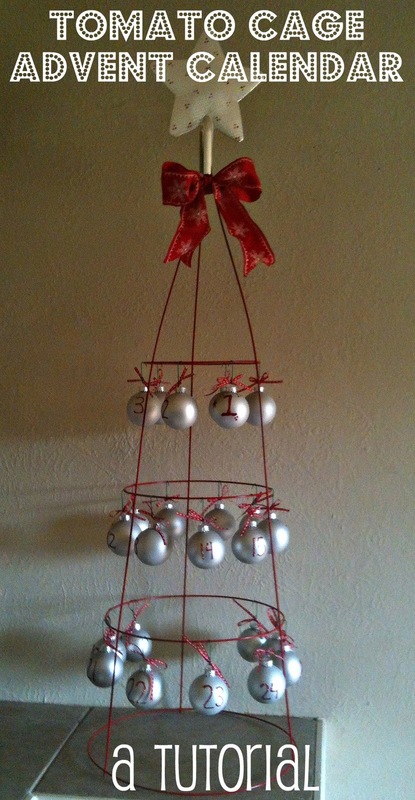 If you want you can dress up the topper a bit (we got this at IKEA last year, and I didn't like it on the tree). Pull the three legs of the tomato cage together and push the topper onto the legs. Cut an 8 inch length of the thin ribbon and tie it in a bow on the ornament. 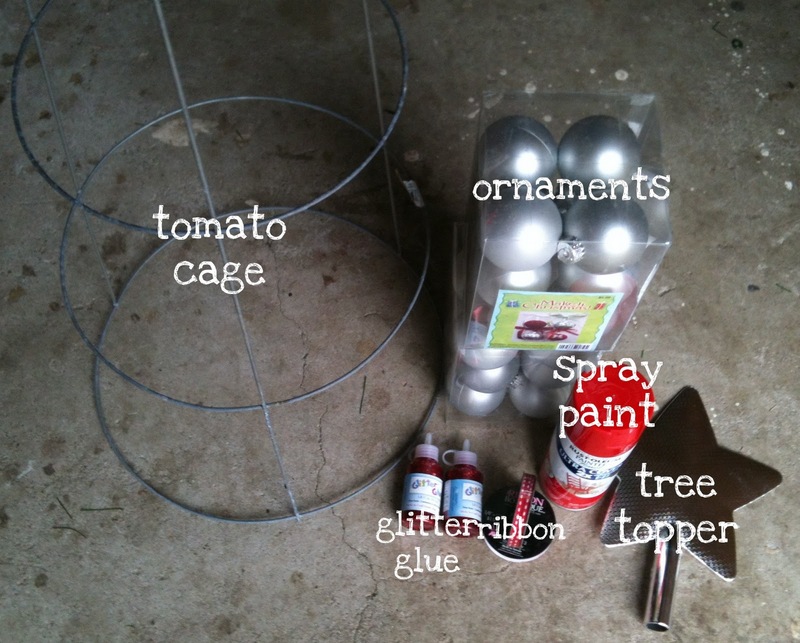 Slide the ornament hook onto the ornament and hang on the tomato cage. 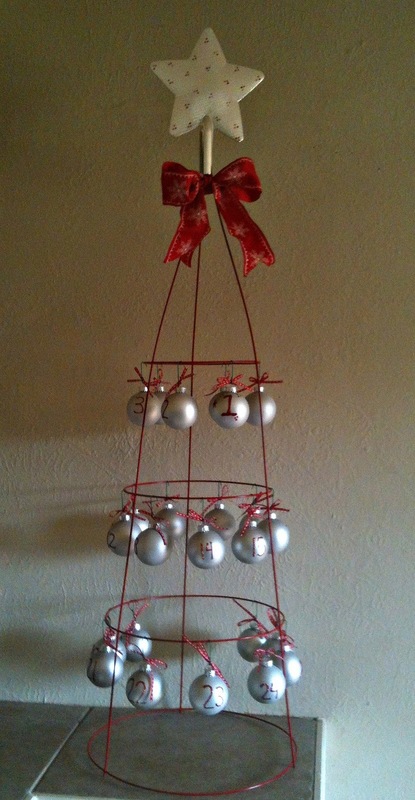 Take a 24 inch length of thick ribbon and tie it in a bow beneath the topper. Stand back and gaze at the beauty. 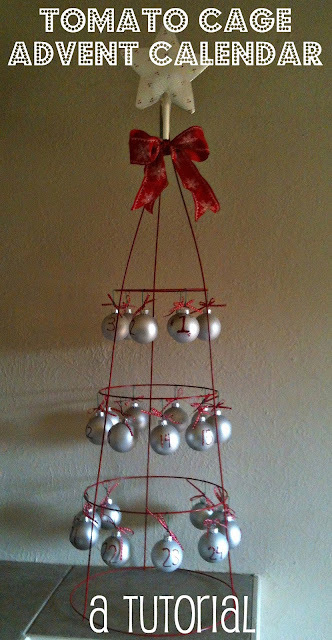 You could do so many things with this, wrap the cage in Christmas lights, wrap it with tinsel or garland, have fun with different colors and many more things! I love this! What a great Idea! Thanks for sharing!